FIFA officially banned Mohamed bin Hammam for life today after he was found guilty of bribing CONCACAF officials. It’s not that this outcome is bad. Bin Hammam deserved to be banned for life. However, the real crime is that Bin Hammam is just the fall guy in a sport full of corruption. Corruption in soccer is the worst kept secret in sports. Bribery is commonplace and every major FIFA figure turns a blind eye to it. And it stayed this way until Bin Hammam recently decided to challenge Sepp Blatter for the FIFA Presidency. 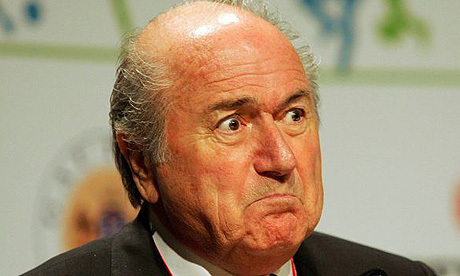 Bin Hammam had won Qatar the right to host the 2022 World Cup and had the greatest chance of beating Blatter. Blatter has been president since 1998 and won reelection in 2002 and 2007 unopposed. While rumors of bribery existed in 2002, they were not pursued as no country or individual had any incentive to challenge Blatter, the most powerful man in the sport. On Tuesday May 3rd, the CONCACAF Congress met in Miami and Blatter and bin Hammam each had the opportunity to address the members and make their case. But, a day before the meeting, bin Hammam said that he wasn’t able to make it due to visa issues. A week later, bin Hammam received a chance to address members of the Caribbean Football Union (CFU), who hold 25 votes in the election, at a meeting in Trinidad and he took it, plus some. After the meeting, bin Hammam had FIFA vice president Jack Warner, also the head of the CFU, hand out “gifts” to each CONCACAF member in the amount of $40,000 in a sealed envelope. It didn’t take long for multiple members of CFU came forward and reveal bin Hammam’s transgressions. The General Secretary of the CONCACAF organization, American Chuck Blazer, opened an investigation into both bin Hammam and Warner’s actions in Trinidad. On May 29th, both were suspended from FIFA pending the outcome of FIFA’s own investigation. That same day, bin Hammam pulled out of the election, paving the way for another easy victory for Blatter. On June 20th, Warner resigned from all FIFA duties, claiming he had been undermined by Blazer. With Warner’s resignation, the case against him was dropped and without an official verdict, FIFA presumes that he was innocent. Why does the investigation end exactly? If Warner decides to become involved again, does the investigation resume or can he resign for a year and then return next year with no questions asked? It’s clear to everyone that Warner was corrupt, but FIFA made sure to preserve his image anyways. As for bin Hammam, he refused to back down amidst the investigation and received his guilty verdict today. And with that, all controversy surrounding the election ends. At one point, Warner claimed that he would unleash a “footballing tsunami” by revealing the corruption of high-ranking FIFA officials, but soon after, he backed off those statements. If only Warner had unleashed that tsunami and soccer-lovers around the world could have watched as the pompous elite of soccer’s inner circle fell from their high thrones. Instead, we get bin Hammam and Warner as fall-guys and life continues as usual. When Warner was suspended, Lisle Austin took over as acting CONCACAF president. His first action? He tried to remove Blazer from his position for opening an investigation into Warner. Well, turns out, Austin doesn’t have that power and he was subsequently suspended as well. So after all the dust clears, bin Hammam is banned, Warner is out and Austin is an idiot. Blatter is still president and corruption is still king. And the most non-surprising part? There isn’t an investigation into Qatar’s victory over the 2022 World Cup. There already have been reports that bin Hammam used bribery to win Qatar’s bid, but Blatter isn’t going to open an investigation. Will FIFA ever be clean? I doubt it. Blatter has set a standard of corruption that has infiltrated nearly every member of the organization. If you aren’t giving out bribes, you aren’t going to be around long. I was really hoping the entire system would blow up, reveal Blatter for the liar he is and begin to restore a level of honesty to the game. But no, Blatter succeeded again in sweeping it under the rug. Anyone with inside knowledge of the system refuses to speak and anyone familiar with the organization has lost all faith in its credibility. Soccer continues on its downward spiral and FIFA execs continue to build up their bank accounts. Next ›Talking About HoF for MLB Players Under the Age of 28? Really?